Late one morning in September 2002, a luxury mega-yacht named the Reef Encounter cruised slowly into the tiny Milne Bay harbor of Kwaraiwa. There were twenty-one passengers and a crew of nine aboard. Each passenger occupied a private suite with bath. After days of scuba diving in resplendent coral reefs and visiting enchanting tribal villages, the passengers met on board for cocktails, a catered dinner and a PowerPoint presentation about the state of the area’s ecosystems. Milne Bay, a province that’s a large archipelago off the southeast coast of Papua New Guinea, they learned, possesses some of the most impressive and bountiful reefs in Melanesia. 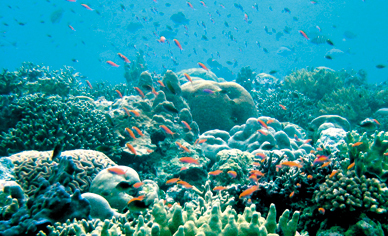 While biodiversity remains high in the region, the impending collapse of about 8 percent of the area’s reefs, and early signs of “habitat degradation,” have raised the concern of local citizens and the international conservation establishment, a few key members of which were aboard the Reef Encounter. Their mission was pre-emptive: to stop the archipelago’s decline in biodiversity before it becomes irreversible. Eastwood, as it turned out, was not on board, nor was Ford. Ford might have been, though, as he is a loyal member of the CI board, its celebrity poster boy and a generous donor to the organization. Eastwood would have been along for the ride. World-renowned oceanographer Sylvia Earle was there by Seligmann’s side, as was Stone Gossard, rhythm guitarist for Pearl Jam. Gossard and his girlfriend were hoping to explore ways, through support of CI’s work, to offset the 5,700-ton carbon footprint Pearl Jam was about to create with an upcoming world tour. The major “targeted” donor aboard–and there is almost always at least one on such voyages–was H. Fisk Johnson, CEO of SC Johnson (a company based in Racine, Wisconsin, whose products include Pledge, Drano, Ziploc, Raid, Glade and Windex). Fisk is number 215 on the Forbes 400 list of richest Americans, and he is known to be a generous supporter of conservation. Seligmann is a legendary fundraiser in conservation circles. He has to be. Aside from funding enormous conservation projects around the world, he must meet a payroll for more than 800 people, pay rent in twenty-seven countries, subcontract with hundreds of organizations and maintain boats and other vehicles around the world. To court high rollers like Johnson, an internal department called CI Sojourns was created. It was that office that leased the Reef Encounter–which goes for $25,000 a day, according to the ship’s owners–and made the arrangements for its expedition to Milne Bay. The trip paid off for CI Sojourns. Pearl Jam did not come through, but Johnson is now on the CI board with Ford; Queen Noor of Jordan; Lewis Coleman, president and CFO of DreamWorks; Nick Pritzker, CEO of Hyatt; Wal-Mart chairman Rob Walton; former World Bank president James Wolfensohn; Gordon Moore, co-founder of Intel; and Lt. Gen. S.K.I. Khama, who ascended to the presidency of Botswana in April. There were also four representatives of Moore’s foundation, who flew in from San Francisco on a chartered jet and stayed at the plush ($500 per night) Karawari Lodge while they waited for Seligmann and the Reef Encounter to arrive from Cairns, Australia. The Gordon and Betty Moore Foundation was well into a ten-year, $280 million commitment to CI, the largest grant to a conservation NGO in foundation history. So a substantial portion of CI’s future support was aboard the Reef Encounter that day, an impressive array of wealth and generosity. However, the islanders had no interest in CI’s large donors: it was the mere mention of Dirty Harry and Indiana Jones that drew them to the beach and gave Seligmann the rapt audience he sought for his clear and simple message. “Five years ago we dove in these waters and saw tuna and other large fish everywhere,” Seligmann told the citizens of Kwaraiwa, according to islanders who remember the visit. “This week we have been diving wherever we could on our way to your island, and the big fish are gone. Our scientists tell us that the biological diversity, health and productivity of your marine systems are eroding rapidly. We want to restore biodiversity to your reefs and fisheries and believe that with sound science, enough money and your help we can do it in ten years.” In a part of the world where fish is food and food security is a constant worry, this was a welcome message, particularly when spiced with promises of debt reduction, new schoolhouses, water systems, clinics and community centers. “Peter told the island councilor to come up with a list of what the community needed, to be given in a week, and he would deliver in three months,” wrote David Mitchell, a former CI staffer familiar with the practice of trading modern goods, known in the region as “cargo,” for conservation, in an e-mail to CI staffers in 2002. “When I heard this I advised the councilor to put together a small list of mostly urgently required items and not to be greedy. I also told him that Peter was really looking for conservation and that this list should not be tied to it.” To tide the village over while they awaited Seligmann’s cargo, Sylvia Earle signed one of her magnificent marine atlases and donated it to the school. For the next two weeks the Reef Encounter continued to cruise between dive spots, dropping anchor at islands with names like Nuakata, Iabam and Pahilele. At some the big-fish message was repeated, ecosystem collapse forewarned and more promises of cargo proffered. When the voyage ended October 1, passengers were driven to Alotau, the capital of Milne Bay province, where they caught chartered flights to Australia and beyond. Five stayed on to dive in Indonesia’s lush and remote Raja Ampat islands, a future CI conservation site. The day I left Alotau, Neville was threatening to confiscate all of CI’s equipment, evict its last two staffers from their offices, seal the doors and ask the country’s prime minister, Sir Michael Somare, to expel CI entirely from Papua New Guinea. Somare is the longest-serving national leader in Melanesia and is highly regarded among his peers in the region. An expulsion from PNG could spawn a domino-chain of evictions against CI through the entire South Pacific. And CI has grand ambitions in the South Pacific. So Seligmann is fighting back with all the PR muscle and diplomacy he can muster. A global reputation is at stake, and scores of supporting foundations, banks, national governments, development agencies and corporations are watching. CI admits that the Milne Bay Project faltered, but it blames the outcome on “insurmountable political and institutional issues, that, despite our best efforts, we were unable to resolve.” That is code for Governor Neville, who, says Seligmann, made a frontal attack on CI when he sensed that his people were being “tricked into embracing conservation.” Seligmann also denies any financial impropriety and invites the audit that Neville threatened. And Seligmann predicts that once the storm settles from CI’s first foray into Milne Bay, phase two will commence and CI will be back in action. No one I interviewed in Papua New Guinea, some of whom were serving out their last days on the CI payroll, held that assessment. They, the UN, the Global Environmental Facility and the project’s three independent evaluators all placed blame for the fiasco squarely on the shoulders of Seligmann and CI’s leaders, who, they say, ran the “community-based” project with minimal concern for or understanding of the culture, historical practices or traditional ecological knowledge of the islanders. Until Christian missionaries flooded the South Pacific with Bibles and rosaries in the late nineteenth century, cargo cults were common. These bizarre sects literally worshiped the goods that were unloaded from the shiny boats and airplanes that floated and flew mysteriously into the region as global trade expanded. Cargo was manna from heaven, and the white men who brought it were revered as demigods. When missionaries gave the islanders something more powerful to worship than cargo, most, though not all, of the cults disappeared. What has not completely dissolved in Melanesia, however, is the cargo mentality, a residual desire for material goods that makes it easy for a super-wealthy organization like CI to get attention by promising schools, clinics, boats and community centers–cargo–in return for compliance with a conservation agenda designed in and imposed from Washington. And that, to the horror of CI’s regional staff, is precisely the path Seligmann followed as he and his boatload of demigods cruised through the islands of Milne Bay. At Nuakata, Seligmann and his fellow travelers displayed their wealth by purchasing its small fleet of rustic but well-crafted outrigger canoes, which were loaded onto the Reef Encounter’s upper deck and shipped back to America to adorn CI’s offices. The $50 per canoe was a steal by American standards but a windfall to a people who have only recently seen the face of Ulysses S. Grant. Although Seligmann was repeatedly warned by his local staff that trading cargo for conservation would never work, he persisted. Long before the Reef Encounter arrived, the islanders and the national government of PNG were aware that the 210-island archipelago of Milne Bay was ecologically important. Local long-line fishermen and others from faraway ports were depleting vital fish stocks and had killed thousands of endangered sea turtles in the process. Aggressive harvesting of shark fins and bêche-de-mer (sea cucumbers) for the booming, delicacy-obsessed Chinese culinary market was threatening those species, while rotational agriculture and a growing human population put stress on shoreline ecosystems. Kinch is Australian, married to a Papuan and has three children. He has lived in PNG and plied the waters of Milne Bay for ten years. He knows many of its leaders by their first names. For the two years before the project’s start-up he researched and co-wrote two studies for CI and sent voluminous memos to Port Moresby (PNG’s capital) and Washington on the ecological and social conditions of the islands in Milne Bay. Many in and outside CI believed he would have made an ideal chief technical adviser (CTA), the project’s top management position, which would be filled as soon as the funds arrived from the Global Environmental Facility and other supporters. The problem with cargo conservation, Kinch warned, is that the local incentive to conserve natural resources shifts from restoring food security to obtaining cargo. So when promised goods are not delivered, the conservation motive disappears. Local leaders may then begin putting a hand out for more cargo–this time from commercial fishing companies and other exploiters of the reef. With few heeding his advice, Kinch resigned in 2003 shortly before MacKay came on board. In the months that followed, the project descended into disarray. Morale collapsed, money was squandered and funders began to have second thoughts about CI’s choice of a project manager. CI, which had created so many promising and generous jobs for so many scientists and local leaders, some of whom told me it was the best job they’d ever had, was becoming the bête noire of Milne Bay and, worse by far, of the conservation funding community. “Project management by CI has been extremely poor, indeed negligent,” reads the evaluation, “with poor reporting, excessive charges for overhead expenses, a poor relationship with provincial government officials and little or no effective oversight or control of project activities…. There are records from early 2005 expressing serious concerns…. Yet CI Washington made no effort to investigate and resolve the issues. Had CI intervened at that time the project could have delivered good results.” That was written by people who told funders and local Milne Bayans that in composing their final report they had restrained their negative opinions of CI. To be fair, the Milne Bay Project was not a total failure.The biodiversity assessment it produced between 1997 and 2002 is still of some use. And while CI’s behavior painted an unfortunate picture of international conservation, conservation remains part of the daily conversation in Papua New Guinea’s island communities, and several grassroots efforts have emerged since CI left the area. And to be fair to Seligmann, one must keep in mind the nature of his job. Supporting huge staffs and infrastructure demands that the CEOs of enormous, quasi-corporate entities like CI keep fundraising high on their agenda; goal one, in fact. When you have to raise $100 million a year just to break even, there isn’t time to think about much else. By most accounts the Milne Bay area’s marine health is pretty much as it was before 2002. The large fish–tuna, marlin, barracuda and sharks–are back. If they left at all it was only for a while, perhaps drawn eastward by El Niño, a warm current of water that appears every three to seven years in the eastern Pacific and temporarily disrupts the oceanic food chain. When I first interviewed Seligmann I asked if he knew that 2002 was an El Niño year. He refused to answer that question, among many others. Later, through his media director, he asserted that CI had every intention of returning to Milne Bay to complete its mission there. Then, shortly before this article went to press, The Nation received Seligmann’s replies to my questions through CI’s lawyer. Seligmann now says he had known it was an El Niño year and claims that “an independent audit of the project found no financial irregularities.” He did not say who had performed or paid for the audit, or provide any documentation of its existence. “We were used, and it will be hard to face some of the people we worked with in the future,” remarked local program manager Bena Seta the same day. “It’s going to be difficult to achieve conservation in Milne Bay in light of all the broken promises,” says Geoff Callister, an anthropologist on the project, who, when I spoke with him in November, was suing CI for six months’ back pay. “WWF [World Wildlife Fund] is good here, and so is TNC [The Nature Conservancy], but they and all foreign conservationists have been tarred by the CI brush. It’s hard for any of us who worked on the project to find work here.” Fortunately for the international conservation establishment, TNC and WWF maintain respectable footholds in Papua New Guinea, staffed largely by locals who respect and understand the hundreds of complex cultures that make up their country. While failures of this magnitude are rare in transnational conservation, the Milne Bay fiasco is not a unique episode, nor is CI a lone culprit in the insensitive treatment of local peoples. The Nature Conservancy, World Wildlife Fund, the African Wildlife Foundation and the Wildlife Conservation Society all share CI’s global reputation for imperious behavior, and they also have failures on their project lists. But the Milne Bay story best illustrates the folly of cargo conservation and the arrogance so often projected by well-endowed Northern environmental NGOs in the global South.